Niagara Falls is along the Niagara River which boarders Ontario, Canada and New York, USA. The American Falls and Bridal Veil Falls are on the United States side. The Horseshoe Falls lies on the Canadian side. 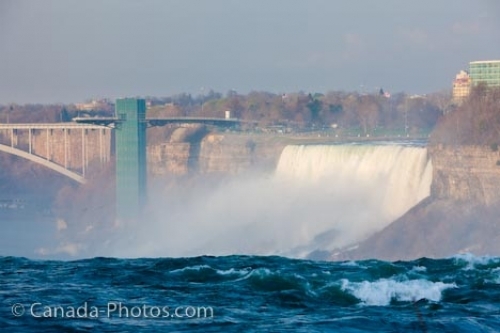 Horseshoe Falls, American Falls and the Bridal Veil Falls make up the wonderful Niagara Falls. The Niagara Falls ie Horseshoe Falls, American Falls, and Bridal Falls attracts millions of visitors each year especially to the Canadian side as the whole scene is best observed from Canada. American Falls (located in the State of New York, USA) and viewing platform seen from above the Horseshoe Falls on the Canadian side of the Niagara River, Niagara Falls, Ontario, Canada.